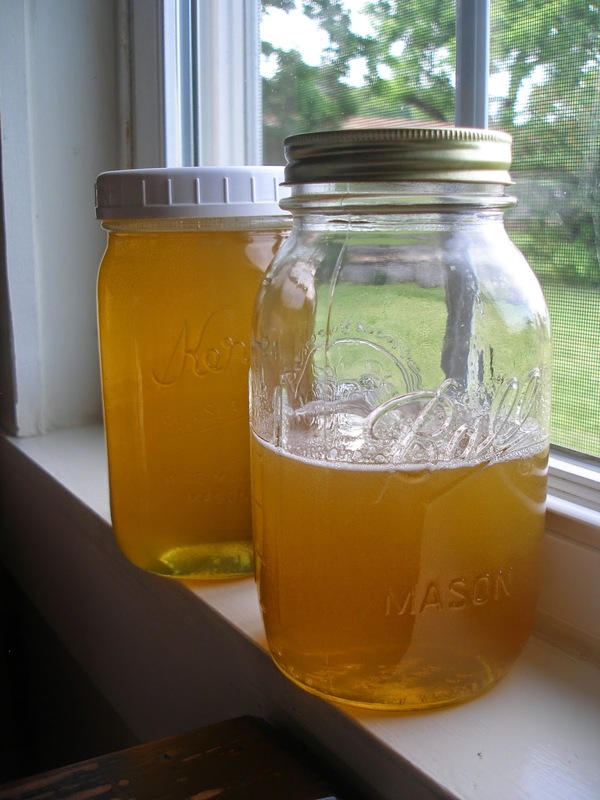 Thy Hand Hath Provided: Our First Honey Harvest! One of the first questions people ask us when they find out we keep honeybees is, "How much honey have you gotten?" It's a very valid question and one that I am likely to ask anyone who has bees, too. In addition to wanting them to pollinate our garden and fruit trees, we have bees because we love honey and we are hoping to get some. Up until now, we've replied to this question with our little schpeal, "Well, the first year it's often better not to take honey so the colonies are sure to have enough to get them through winter so we didn't take any honey last year. We're hoping to this year but we'll have to wait and see." After this past weekend, we're able to answer a bit differently. We were away overnight and didn't get to the hives until Sunday evening. We just needed to do a quick check to see if the two colonies we'd left to raise their own queens had done so (one did and one didn't). 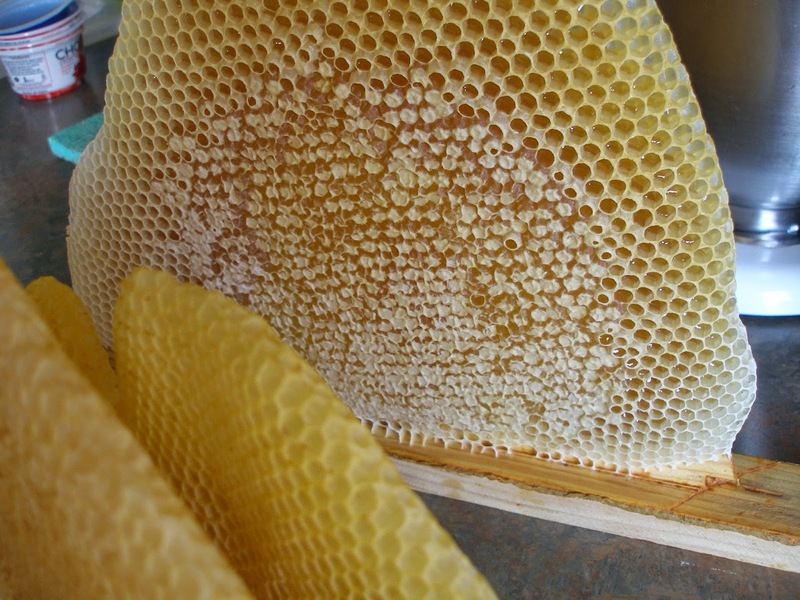 While inside the hives, we came across three bars of pristine comb with mostly capped honey. We felt certain that these colonies would still have plenty of stores for themselves and could easily build up stores throughout the rest of the year so we brushed them free of bees and brought them inside. One of the huge benefits of top bar hives is that you don't need anything fancy to extract honey. Extractors are expensive and are made for honey combs on frames of foundation. No such equipment is needed if you're a small-scale top bar beekeeper. 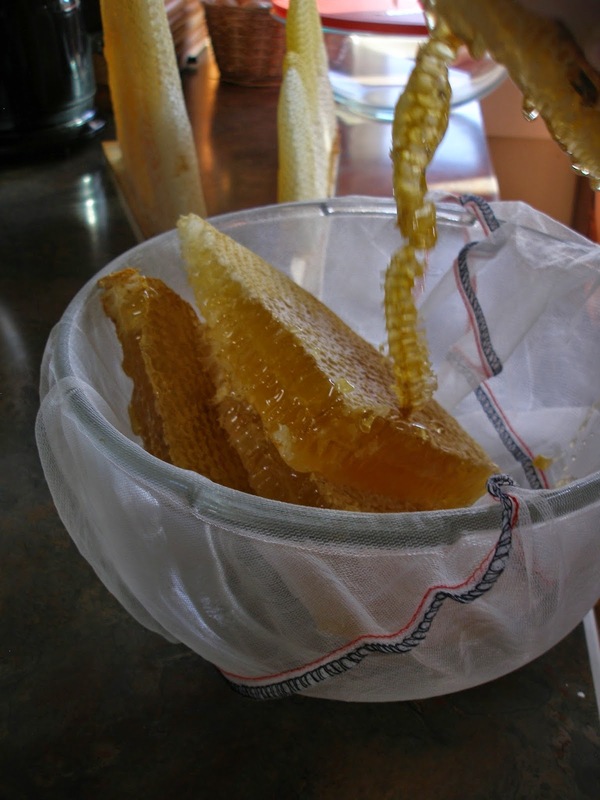 To harvest honey in top bar combs you simply cut it from the bar and crush it, letting the honey drip through cheese cloth or a paint strainer and into a bowl or bucket. 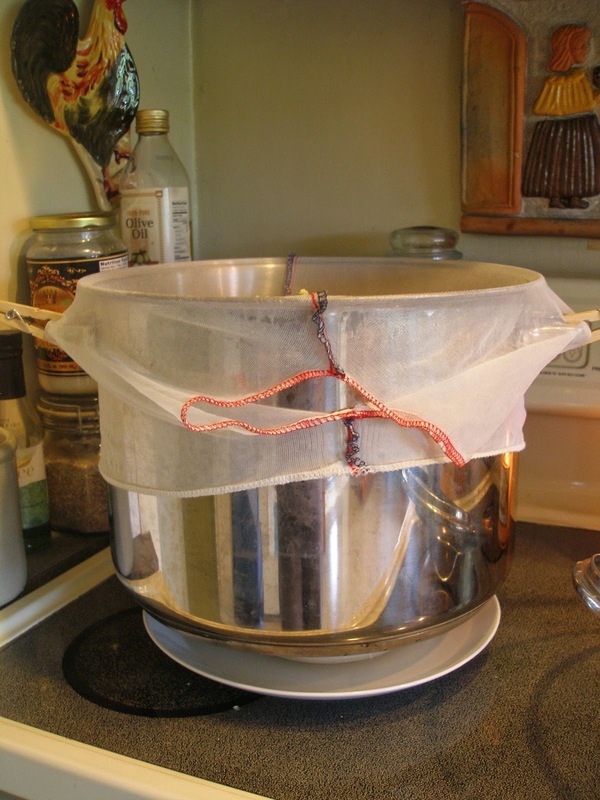 We used a clean paint strainer, my large canning pot, a glass bowl, and a couple clothespins. I've been battling little ants in our kitchen so Jamey created a moat for the pot to sit on so they couldn't get to the honey pot. We also used the lid to keep flies out. 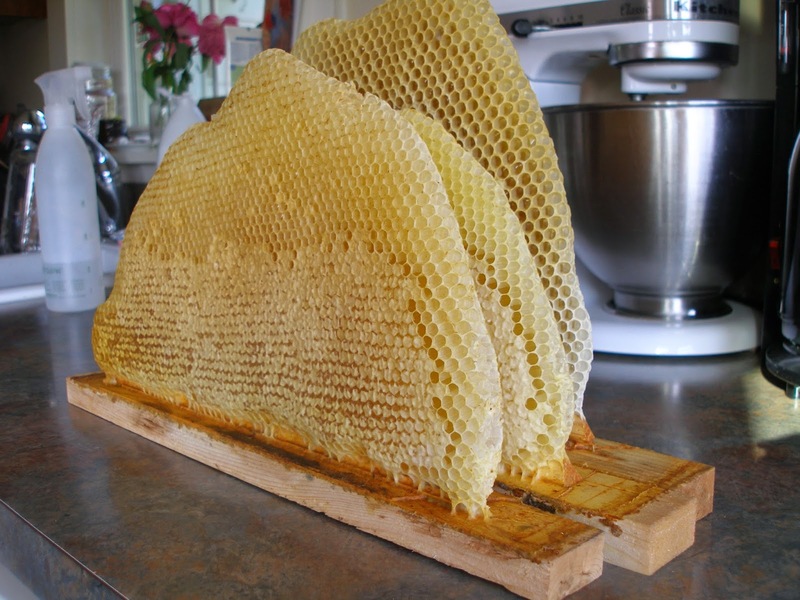 We had no idea how much honey these three combs would give us. We had never done this before. 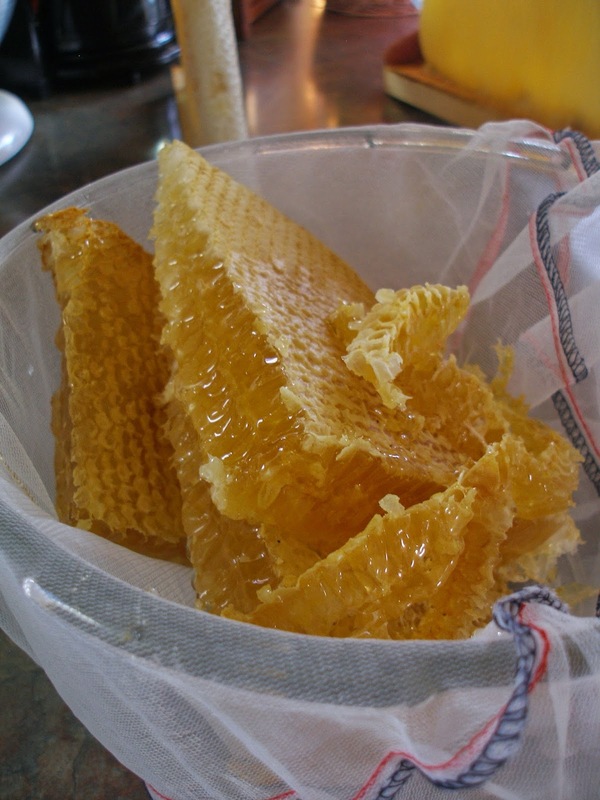 We were delighted to discover that they gave us one and a half quarts of beautiful, local, made-by-our-bees honey. The drained, squished comb was set back outside for the bees to lick clean before we melt it and store it for use in making fire starters. I am so happy for you - you have worked so hard on beekeeping. The results came out beautiful, enjoy. Beautiful. Real gold. I have been looking at keeping bees, but want to get our landscaping a little more complete before I delve into such a venture. The wax is amazing also. Don't you love the smell? Liquid gold and a beautiful sight!! So glad you are able to enjoy some of your own bee honey! The more I learn about the working of bees, the more I marvel at them! It looks delicious, I sure hope I can try my hand at beekeeping someday myself. 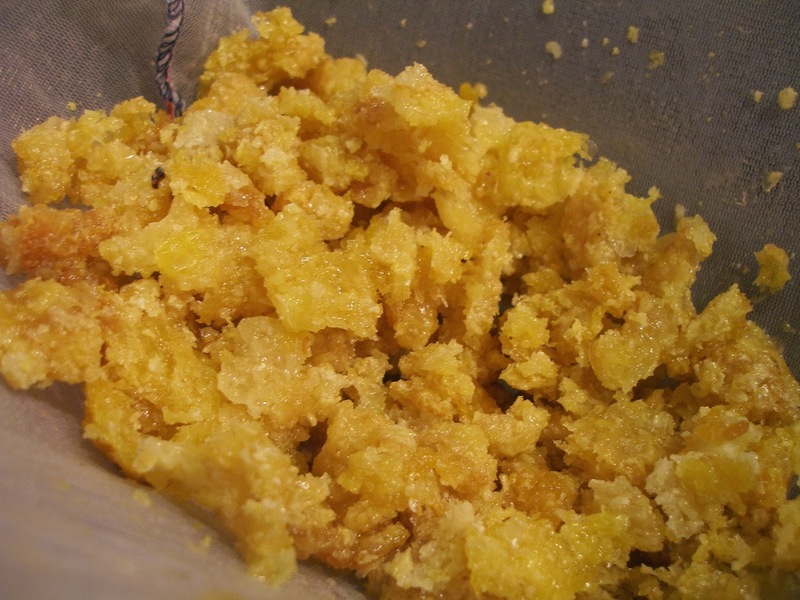 How about making some beeswax candles, as well? They are beautiful and smell so nice! How exciting! That honey looks delicious! oh, this is lovely! So exciting. You do inspire me to try beekeeping. . . I am hoping to take a class this fall & winter before we "dive in" to keeping bees. I think it would prove helpful. I am always inspired by your posts. And, I got my cookbook in the mail. :) It's a delight! How beautiful is the gift of honey! What a sense of accomplishment it has to give you! What is it about the miracle of honey that makes us feel so good? Bless your farm!